It’s all fresh, sweet fruit on first opening. Some rose petal, soy sauce, graphite there in the background and although not exactly a fruit bomb, this wine has a fruit character that jumps out of the glass and definitely separates it from the savory Syrahs of the Northern Rhone. It’s delicious though, there’s a sense of balance on the palate that makes the wine feel full and light at the same time. Day two: The wine is still fruity but there’s an interesting meaty character coming through that I really like. It’s a beautiful wine and on day two doesn’t actually taste much different than day one and that’s not a bad thing. Gramercy Cellars is the brain child of Greg and Pam Harrington who gave up their city life in New York to make wines in Walla Walla, Washington. As you’d imagine, if you’ve ever been to Eastern Washington, that involved quite a bit of culture shock. The move paid off though, as Gramercy Cellars enjoys a reputation as one of the better wineries in Washington state and is renowned for making some of its best Syrah. 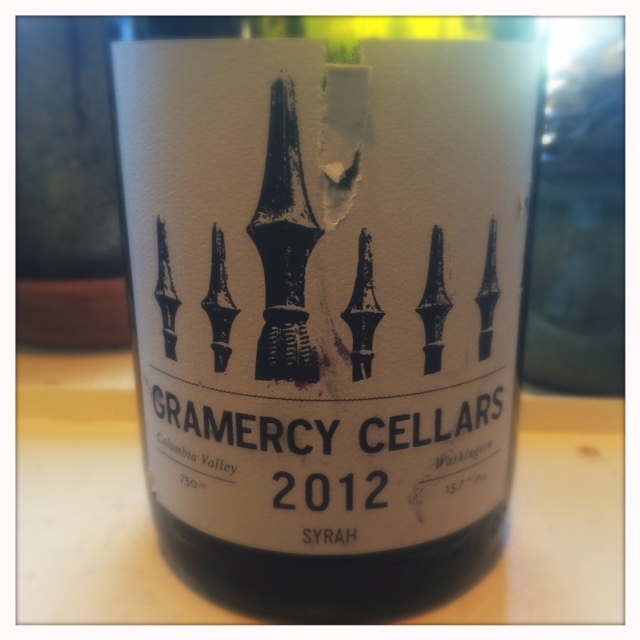 The Columbia Valley Syrah is a new blend for Gramercy Cellars. At $40, it’s the least expensive of their Syrahs. It combines four vineyards, Minick, Olsen, SJR, and Stony Vine. It’s all neutral oak aged and comes in at 13.7% abv. While this wine isn’t totally my style of Syrah, I can see why people fall for it. It has a delicious factor that can’t be denied. And its lack of new oak and judicious alcohol level allows that delectable fresh fruit character to fully express itself. First opening: The wine hits you with a high-toned aroma of fresh plums and gravel, reminiscent of the Northern Rhone and the best of the New World Syrahs I’ve tasted for the blog. Right out of the gate, I can tell this is going to be my kind of Syrah. The palate is full and light at the same time. The mouth-feel is almost textured. Day two, there’s a touch of the vegetal coming through right now because of the 100% stem inclusion. It’s integrated though and adds pleasant complexity. There’s a real savory side to this Syrah that’s intriguing. That plum is coming through now but with a black olive edge to it, and there’s a floral element also. This is quite simply one of the best California Syrahs that I have ever had (which, frankly, at its $60 price tag is as it should be). Failla is the brain child of former Turley wine maker Ehren Jordan who left Turley to start his own winery with his wife Anne-Marie Failla. The winery is Pinot and Chardonnay focussed but those who know Jordan also know that he’s a Syrah expert. He spent his early winemaking apprenticeship in the Northern Rhone and learned to appreciate cool-climate Syrah. Jordan’s become known for making Syrah that’s intensely aromatic with a cool-climate Old World bent but he’s not a cool-climate zealot. He believes Syrah should be full on the mid-palate and has been known to poke fun at cool-climate Syrah makers who make wine at under 12% alcohol. He’s not afraid of his Syrah being broad-shouldered in order to back up all that aromatic intensity. This wine was made in a traditional Northern Rhone style with 100% whole cluster fermentation. It was crushed by foot, and aged in 30% new oak. 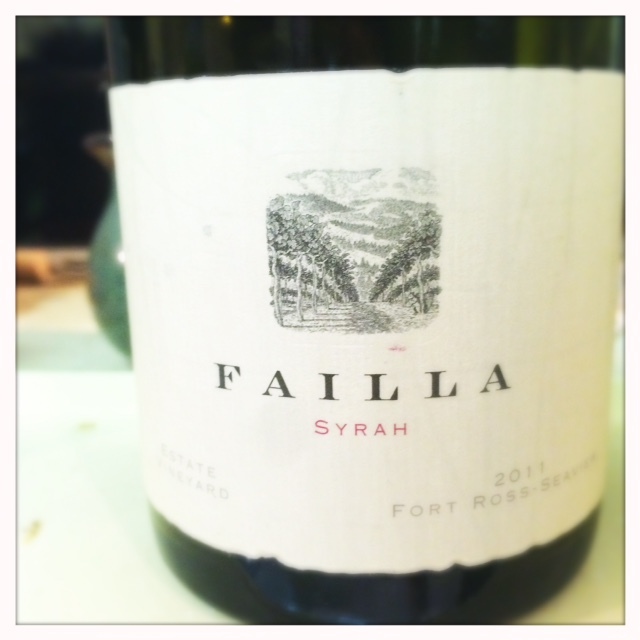 It’s a wine that nods more to the Old World than the New, which is consistent with other Failla Syrahs I’ve had. If you want to taste an elegant New World Syrah that tends toward the Old World, this is a wine to seek out.